You got to love this picture! 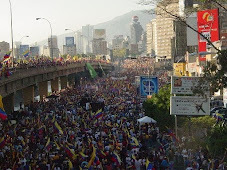 In 2007 there was a wave of protests against Chavez due to the closing of RCTV broadcast. It was strong enough that it got Chavez his first major political defeat with the referendum loss of 2007. The title of a post on May 31 2007 was "The week the Bolivarian Revolution died". It died when Chavez lost the students of Venezuela, and thus the future. Of course, I was writing about the symbolism of that week, full aware in that text that revolutions may see their ideals die but that does not necessarily stop them from dragging on for years. I just did not expect that it would last another 11 years. What is so intensely satisfying in that picture is that the 4 men started their career in the protest years of 2007 or whereabouts. Today you can see them holding the main chairs of the National Assembly. They are the power rising, edging the old opposition class, and perhaps bringing down Maduro. The history books will one day write on the "2007 generation", of these 4 but of several others jailed, exiled and more. They are our future and it is thrilling. Daniel - I have just one word for that write-up - "Beautiful". I am not a Venezuelan but that writing struck an emotional chord with me. I strongly feel that this is the new beginning for Venezuela to put it back on the right track after a tragic detour. Vamos Venezuela! Dunno who Mejia, Pizarro or Gonzalez are. But if they are young, friends of the Gman, great. I'd like to see lots of fresh faces in the next government, young guns like David Smolansky, etc. But I'd also like to see Mr. Leopoldo Lopez and MCM. Zero old gizzards like Ramos Allup and all of that MUDcrap. After all his service and sacrifice, the Great Leopoldo Lopez deserves to be Venezuela's President one day. Amen. I also woukd like to see Guaido as a President for a full term or 2 in the future. The next big worry if Guaido can take leadership to a free election is who would win it. Would Guaido himself be allowed to run in such an election? Can't change the fact that is you set up a scenario of Lopez against a Charismatic lefty promising great oil wealth and sharing it amongst the people that you would end up right back where you were with Chavez. According to the constitution he cannot run this time. A very dignified demonstration of Venezuelans in Argentina. Same in Doral. Problem is that in the states if you are talented and put the work in you can make a success. Will they ever want to return to develop Venezuela? BTW, that Gonzalez is Stalin González. That name definitely rings a bell with me. Stalin Gonzalez's being a leader in the opposition shows us that not all Venezuelan red diaper babies end up like General Vladimir Padrino Lopez, or Ilich Ramírez Sánchez, a.k.a. Carlos the Jackal.